Instant Pot Pressure Cooker Mr. Yoshidas Chicken Rice is a quicker version of my Pressure Cooker One Pot Chicken and Rice recipe for moms and dads on the go. 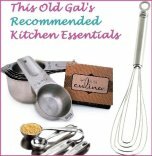 If you have been following my recipes, you will already know that I love making recipes completely from scratch. You will also note that I love to cook with Asian sauces, spices, and ingredients. 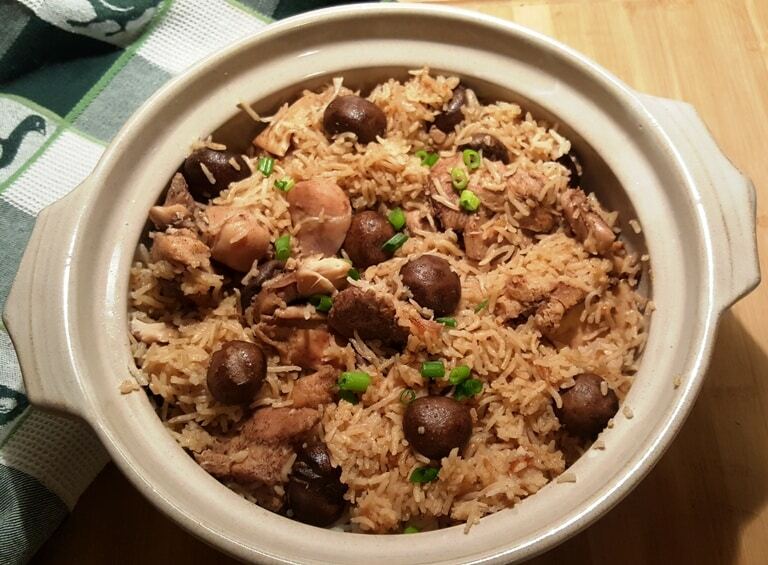 However, as I wanted to present to my readers with a super simple and very quick recipe that can be prepared in a very short time, today, I bring to you a simple one-pot Pressure Cooker Mr. Yoshidas Chicken Rice prepared with just Mr. Yoshida’s Marinade. My friend ワタナベ 聡 got me interested in using a Donabe (Japanese Hot Pot) for cooking. But, I love it so much, I like to use it as a serving piece too. ワタナベ 聡, presented me with this beautiful Donabe (Japanese Hot Pot) last year and asked me to use it in an easy Chicken and Rice dish, which I did and has been very popular. Some of you have asked me to make a quick version of my One Pot Chicken and Rice recipe and so I did. ワタナベ 聡 tells me that thighs (dark meat chicken) are the most used in Japan. She also says that chicken must be marinated at least one day, to absorb the flavor. She is right! Take several freezer safe bags or containers and divide the chicken into family size servings. Add Mr. Yoshida’s Marinade, or any of your other favorite marinades to the packages and pop them into the freezer. If you use a different Marinade, it may be thicker and therefore, you will need to add additional liquid to the Instant Pot or Pressure Cooker. 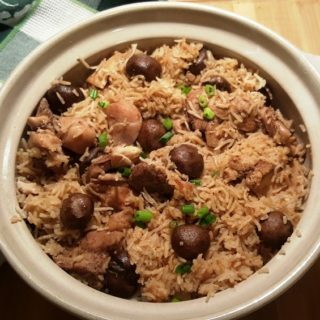 If you like to make your marinade from scratch, try my Pressure Cooking One Pot Chicken and Rice recipe, as it tastes very similar to Mr. Yoshida’s Marinade. 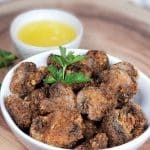 Add the marinade into the Bowl of chicken and mushrooms and allow the chicken and mushrooms to marinate in the refrigerator overnight, or at least 30 minutes. I love serving this Pressure Cooker Mr. Yoshidas Chicken Rice in my Donabe (Japanese Hot Pot). 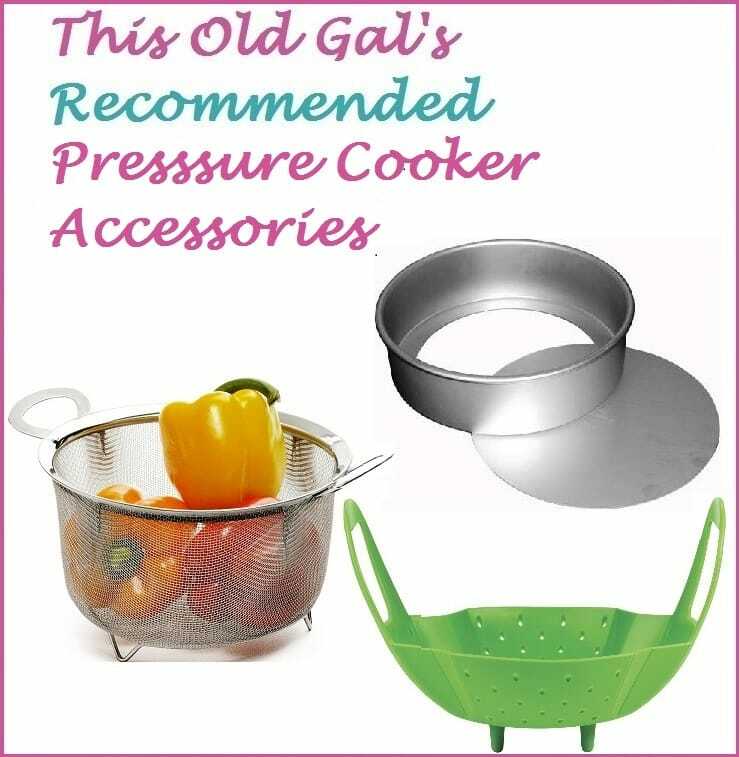 Its purpose is to be used on a burner at the table with a hot broth, meat, and vegetables. 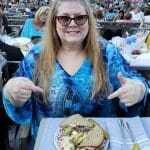 Diners sit at the table and take what they want and if needed, more meat and vegetables are added. Noodles are added at the end after the full flavor of the broth is formed. It’s a lot of fun! 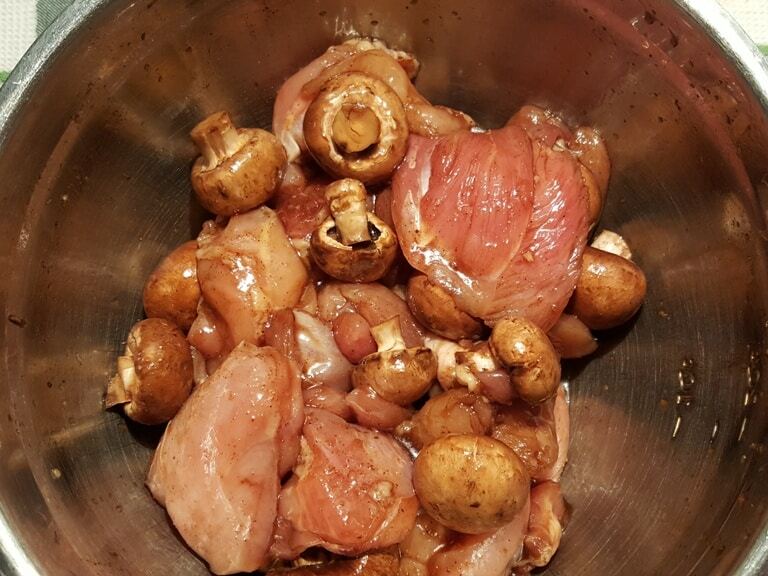 Remove fat from chicken and cut into large chunks and place into a bowl. 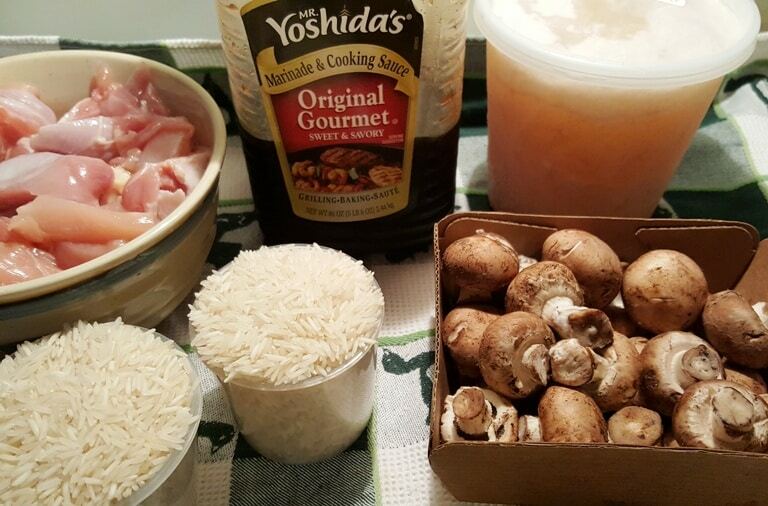 Pour Mr. Yoshida's Marinade over chicken and mushrooms and set in refrigerator overnight, or for at least 30 minutes. 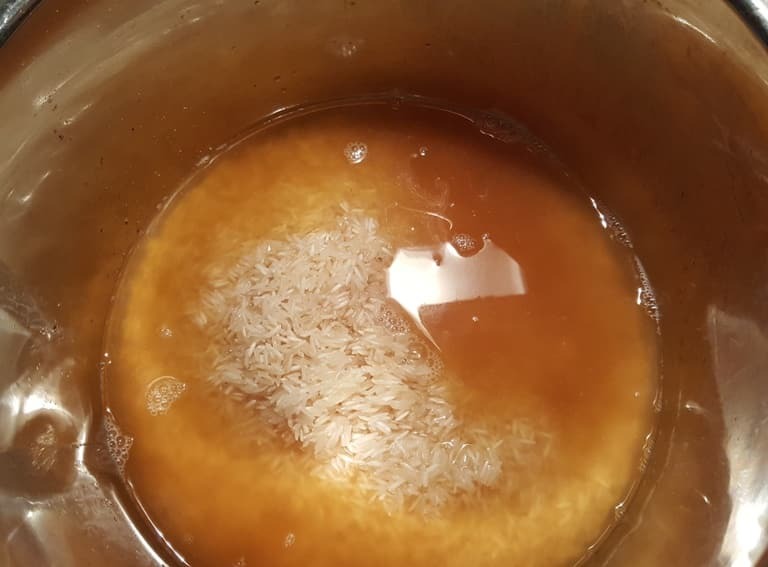 Add rinsed rice, broth and chicken/mushrooms to your Pressure Cooker cooking pot. Lock on the lid and Close Pressure Valve. 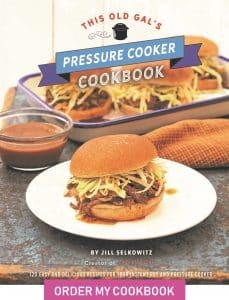 Cook at High Pressure for 4 minutes. When Beep sounds, wait 10 minutes and then release the remaining pressure. Any of your favorite marinades will work in this recipe. PIN this Instant Pot Pressure Cooker Mr. Yoshidas Chicken Rice! 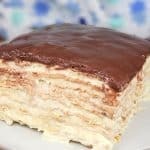 Hi, this looks delicious! I went to the grocery store today looking for yoshidas, but thry don’t csrry it so I got a lovely gourmet looking teriyaki marinade. Do you think the flavour profile of yoshidas is similar to teryaki, or am I in for a totally different experience? That is the beauty of this particular recipe. You can have a different flavor experience based on the sauce you use. That is the reason I wrote the recipe this way, although maybe I should have called it “Whatever Flavor You Like” Chicken and Rice. Usually Costco sells Mr. Yoshida’s and I know Amazon does as well. I would love to hear back from you after you make the dish using your marinade. I love this dish. Thank you for sharing it. I made it with shitake mushrooms (my favorite). The instructions were clear and the flavors were great! Hi there! I followed your recipe – doubled it, but it’s not cooking. I tried the manual function in the beginning then tried meat/stew later. Both on high pressure. Float valve doesn’t even come up. Am I doing something wrong? Thanks! Did you use the rice cup to measure the rice and a measuring cup for the water? I’m the only person in my family that likes mushrooms. So, I’ve got about 2 pounds of chicken, and 1/2 pound of smoked sausage marinating now. I’ll follow all other directions tonight. I love mr yoshidas! 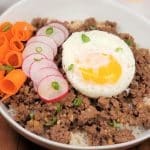 Will i be able to make this with brown rice instead of jasmine? Thank you so much! 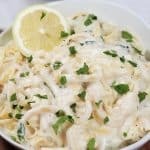 Do you think it would be possible to make this as a freezer meal? 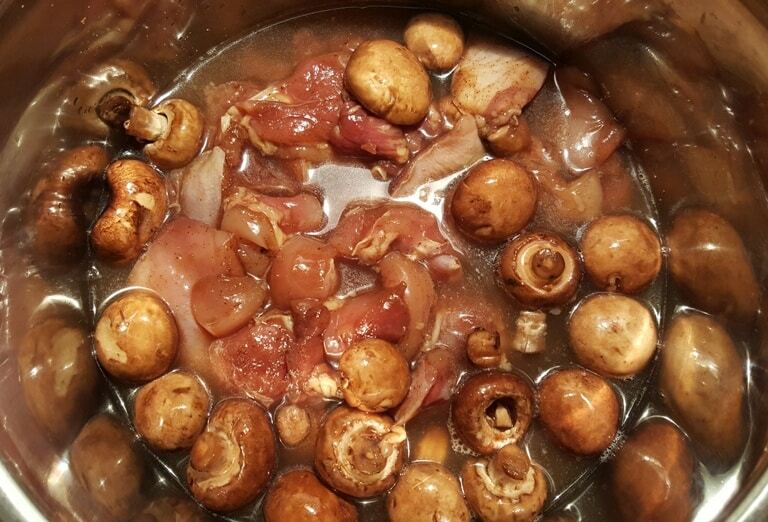 Marinated chicken, mushrooms, and rinsed rice frozen…add liquid to cook? It sounds delicious! This was delicious and easy as could be. I do have a qustion though, there are just two of us here and can this be scaled down by 1/2 by cutting all ingredience in half but keeping cooking times the same. Confused. As to how much rice to add . Your recipe states that 6 oz weighed dry is equal to 8oz measured , so i don’t know whefe that little cup that came with my instant pot is, and dont have a scale. 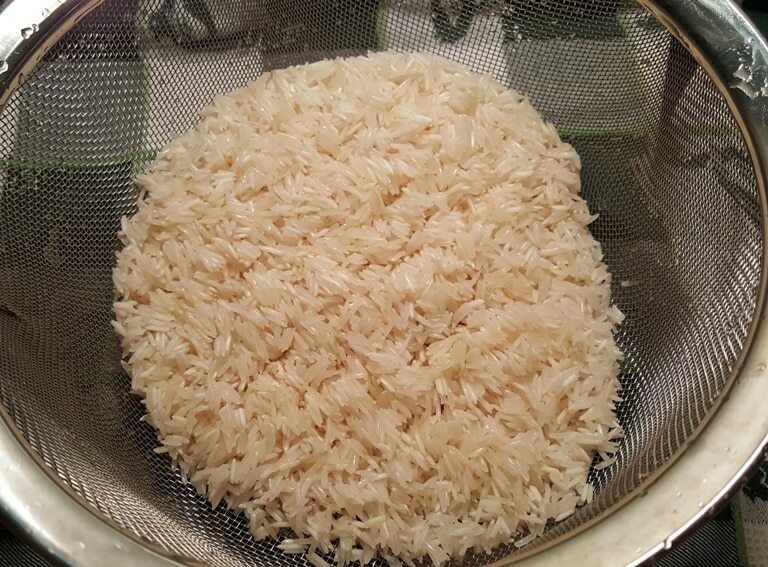 Would be helpful to note how much measured rice to use. So am winging it and hoping for best!